Let me introduce you to my collection of mini-chalets, inspired by my addiction to architecture in its various forms! They are all vintage of one age or another and come from the usual sources - French flea markets and English junk shops. I guess they all started life in souvenir shops in various mountainous parts of France and adjoining countries, transported to their final resting places by holiday-makers during the last 40 years or so. There's something about the scale of model buildings that intrigues me - the idea that you can pick up in your hand and re-position a piece of architecture. I suppose there's a Gulliver element to how we view models but for me it's also about being able to see a building in its entirety from all angles - not possible in real life - and which allows the viewer to perceive the building as a whole sculptural object. I've used architectural models in my Plaster Bust collection because of this fascination. In photographing them for this post I looked at the detail in a way I hadn't done before and it's quite fascinating to note the different styles and effects used to make them look 'real'. (!) This really is a de-luxe version. The detail helps to date them too - I think the style of the windows in this one looks 1940s. Some are more rough and ready than others - which I prefer to the really over-the-top Heidi-style numbers. This is the only one I've come across with a 'concrete' effect on the wall. The bench looks a bit dodgy! Actually, I used to really hate chalets , finding them naff and cliched as an architectural form. I think I started collecting them as a bit of an ironic joke, but through close proximity began to find them intriguing and now think it's interesting that one specific house style could become so iconic and open to continuous re-interpretation over centuries. 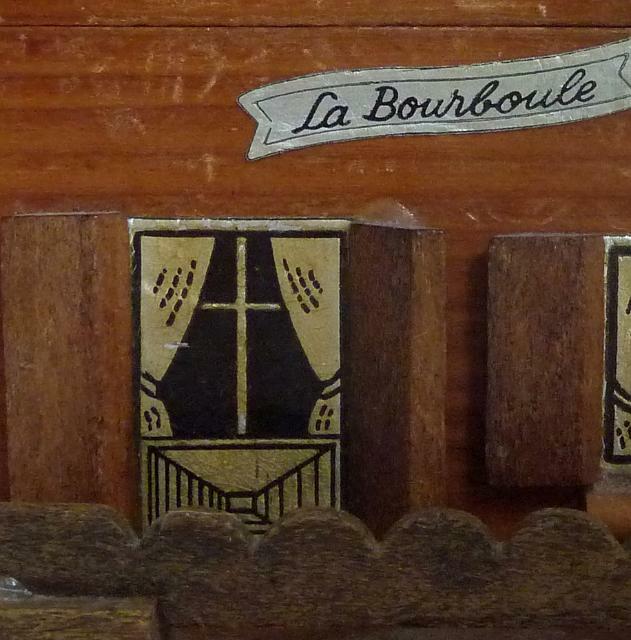 'La Bourboule' is vying to be my favourite - I like them when they are simple, the decoration is minimal and the wood is more like real wood i.e. not stained and highly varnished. 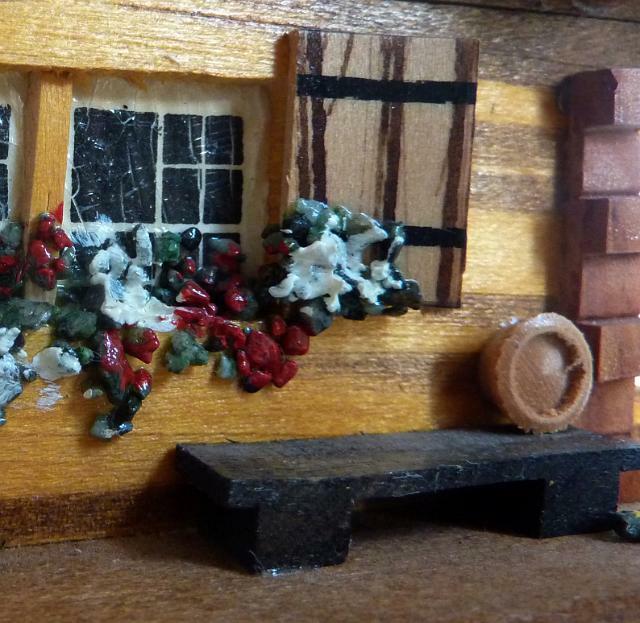 There seems to be a rule in the model chalet world that the exterior must include all or some of the following: pump, water trough, pile of logs, bench, bizarre random wooden platter propped against the window! I have seen in real chalet style houses how they place large rocks on the roof to stop it flying off in the winter storms. It's fascinating how models are often half right and half wrong in terms of scale. Parts are convincingly real and parts are too clumpily large. What were those bowls for???? 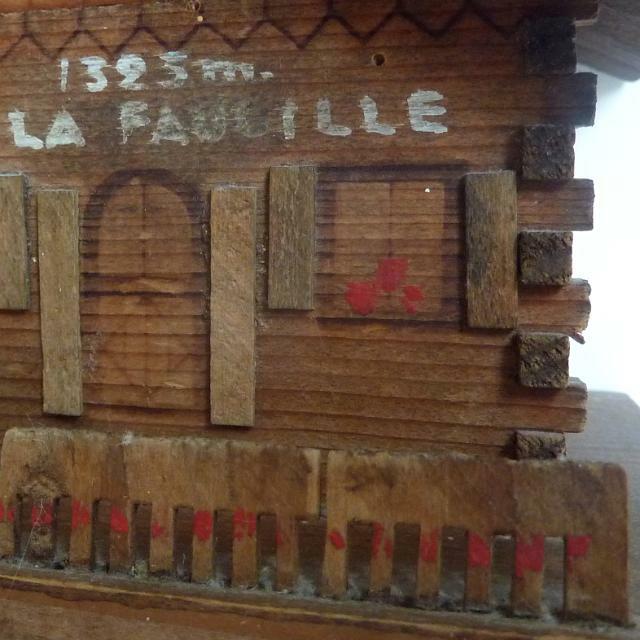 I'm afraid 'La Bourboulle' loses out to 'Gex La Fauville' (standing at an impressive 1325 metres above sea level) as my ultimate favourite. The simple scalloped decoration, the grained wood, the crazy fence and the hand painted sign all combine to make it the less-is-more design hero of the chalet world. I forgot to mention that these all have a jewel function as musical boxes - you won't be surprised to learn that 'Eidleweiss' features quite heavily in the list of tunes. I have 10 in my collection so far and pretty sure I'll be adding to that number this summer given the French vide-greniers I'll be frequenting during my holiday. There's obviously something about a chalet which captures people's imagination - perhaps they represent a particular idyll - life in a wild mountain landscape but with cosy protection from the extremes of high altitude weather. Apart from the obvious city landmarks, I can't think of any other architectural style so repeatedly interpreted as models - so there's definitely something evocative about the chalet! There is another architectural style repeated as models; the North American Indian teepee. I am not certain if they are still being made but they were available in the 40's? to about the 70's I believe. They were made out of a piece of birch bark and attached to a birch bark base. Canoes were also available. I had a teepee when I was a kid. A friend of mine collects them. 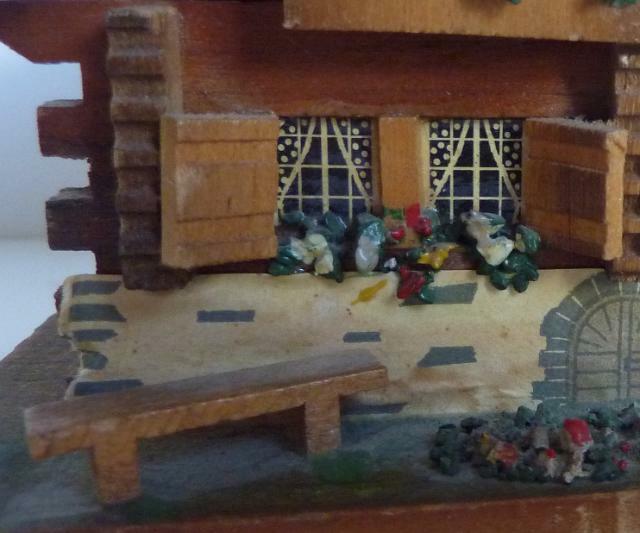 I love the detailing on the chalets, they are doll houses for grown-ups. It has a use so that validates them. My favourite chalet hands down is the unadorned one with the bottle brush trees. It trumps your favourite 10 to 1! Our oldest son married a Swiss girl and lives in Thun Switzerland. In Grub where her parents lived every house it seemed had a water trough. The old houses in Switzerland have the most beautiful cut shingles on the outside walls. They are in a variety of shapes such as diamond, semi circle and a 2 to 1 rectangular shape. All of the shingles are about 10cm - 15 cm (4" - 6") across at most. They are left unstained and look beautiful. One house looked like it was covered in feathers and when I had a chance to look at it up close I realized that the shingles were so old that they had split into thin strips and curled up giving a feather like appearance from a distance. Hi. Very nice pictures there. I love chalets and they definitely render that special mood.